Are you in your 20's, 30's, or early 40's, and wondering if what you are experiencing is early menopause? Although uncommon, it is possible to go through menopause early. Early menopause, according to the North American Menopause Society, is menopause that occurs well before the usual age of menopause, at the average age of 51. Some sources designate the age of 45 as the cutoff, and label any menopause occurring prior to age 45 as early. Early menopause may occur naturally, or it may be induced by surgically removing or damaging the ovaries (i.e., hysterectomy or polycystic ovary syndrome), or as a side effect of medical treatments like chemotherapy. Hot flashes are the emblematic symptom of menopause, and they are by far the most common menopausal symptom. Hot flashes feel like a sudden, intense burst of heat is engulfing the body. Different women describe hot flashes differently and hot flashes can be accompanied by irregular heartbeats and perspiration. The severity and frequency of hot flashes vary from woman to woman. 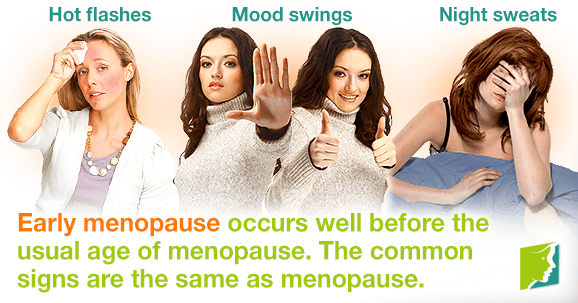 Some women going through menopause experience mood swings. Mood swings can strain personal relationships and be stressful for the person experiencing them. Mood swings caused by hormonal fluctuations can cause a person to react differently and feel more strongly about certain things. These are very similar to hot flashes except for the fact that night sweats occur while you are sleeping, and are accompanied by excessive perspiration. Night sweats can cause a woman to wake up, and if night sweats happen frequently, this can greatly disturb a woman's sleep pattern. Women going through menopause frequently experience irregular periods. This can come in the form of heavier and longer periods and/or sporadic or missed periods. This is because menopause is when a woman's ovaries produce less hormones, and hormones are what regulates menstruation. Although there are many other reasons why you could be experiencing irregular periods, it is important to talk to your doctor to find out the cause.